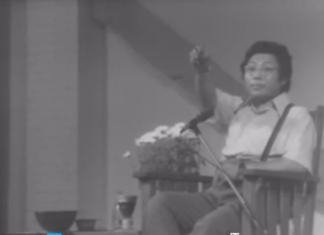 There are over 1,500 slides of Chogyam Trungpa’s in the Shambhala Archives, mostly images taken by him, as well as some taken of him by his students. In 2010, Andy and Wendy digitized, color corrected, and catalogued these slides. In this slide show, they share a small collection of these images with the Chronicles. Images: © 2010 Diana J Mukpo, all rights reserved. Used by permission. Thank you to Lady Diana Mukpo for permission to make these images available, to the Shambhala Archives for preserving the collection, and to the Chogyam Trungpa Legacy Project for financial support for the digitization of this collection. Slide show: Thank you to Andy and Wendy Karr for curation and voice over in 2010, when it was originally presented on the Chronicles. Thank you to Andy for reformatting First Thought Best Thought in 2018.